This paper discusses the process of creation of my sound piece Selva de Metal (Metal Jungle), which comes from mechanical manipulation of two works of art: metal sculptures (replicas) – series Bichos (Critters) by Lygia Clark – and ping pong balls – Series Ping Poem by Lenora de Barros. In September of 2012, I was in São Paulo when I received an invitation to work on three radio showsThe three shows named MaisonM were edited, produced and presented live by me at MobileRadio - BSP on November 9th, 10th and 11th, 2012. at Mobile Radiohttp://mobile-radio.net/ Accessed on 05/30/2015. – an artistic project of a temporary radio art created by the English Sarah Washington and the German Knut Aufermann which was taking place in the Ciccillo Matarazzo pavilion during the 30th Bienal de São Paulo. It had been a year since I had moved to this city – probably the largest in Latin America – from Porto Alegre – my hometown, located in the extreme southern of Brazil. During the time I lived and worked in São Paulo, I was awareI resided in São Paulo from March 2005 to January 2011. There I took my Master’s Degree in Design (Design, Art and Technology) at UAM and taught classes about art, design, music, and urban culture at cultural centers, technical schools and universities. of its loud daily life. I paid attention and captured it during walksTravelling and walking through the city streets are the strategies and methods I use to find visual and aural material for artistic creation. They are also aesthetic experiences that compose my work and base the research that is interested in common gestures and the poetics of everyday life. and public transportation rides, as well as at home, through various apartment windows in the many neighbourhoods I resided. The results of this documentation (photographs, texts, poems, videos and soundscapes) were presented in many ways. An interesting work to be mentioned in this paper was the live mash up what I did in one of my web radio shows - MaisonM, with the sound of my video Aurora / Audiopainting with a soundscape of a noisy corner of São Paulo city, recorder in 2010 and sound pieces Pulse Persephone and Nestea by the English composer Daphne OramThe generated documentation was published on academic journals on Design, and are available on blogs such as “Na Orelha” and “Empilhamento”, and social media websites such as Facebook, Youtube, and Soundcloud. 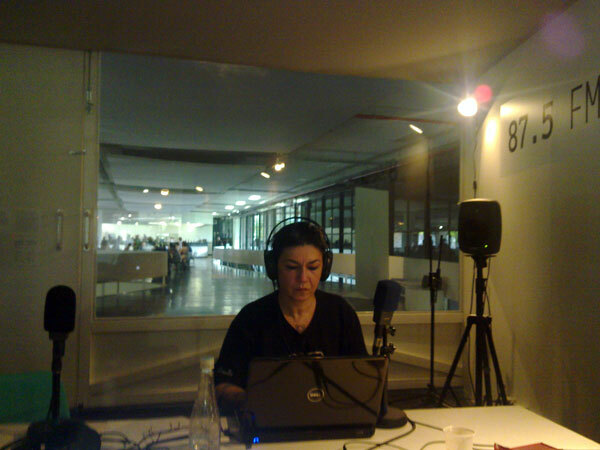 “MaisonM” was a radio project with nineteen programs, one hour weekly, edited, produced and presented by me, with live guests held in web radio minima.fm between 11/11/2011 and 03/16/2012. All Accessed on 05/30/2015.. When I was invited to work at MobileRadio, I reactivated what Murray Schafer (2011) defines as “focused listening.” I started to listen to São Paulo in order to notice the soundscape during those days and to try to find “potential sounds” that would inspire new pieces. However, it was in an indoor situation – my visit to the exhibition Lygia Clark: uma retrospectiva (Lygia Clark: a restrospective)The exhibition Lygia Clark: uma retrospectiva was held at Itaú Cultural in São Paulo, in partnership with the cultural association “O Mundo de Lygia Clark,” and was curated by Felipe Scovino and Paulo Sergio Duarte. The exhibition was held from September 1st to November 11th 2012. – that I found sonic material for the making of Selva de Metal (Metal Jungle). The exhibition, as indicated by its name, showed an overview of the works of Lygia Clark (Belo Horizonte, 1920-1988). Clark – who would rather not be referred to as an artist – was a pioneer in the relational art or relational aesthetics – a term coined by Nicolas Bourriaud in the 1990's, worked with propositions and “performing,”Concerning the opening of new possibilities in Performance Art, we find the spacial idea of performation, thought by Regina Melim (2008), which focus on participation – a relational or communicational (instruccional) condition. when handling the works transform the viewer into participant and art in life experience. In investigating body and space, Lygia Clark created an open, organic and sensorial work that desterritorialized the art field with timeless ideas and attitudes that are extremely relevant to the art history worldwide. In this surprise encounter with the noisy exhibition, I identified the juxtaposition of sounds provoked by the livingness and participation in the artworks, such as the balloons (elements present inside The House is the Body) that would burst now and then when someone passed through and the different noises produced in the handling of the replicas of Critters. Also, there were the overlapping sounds made by visitors, such as laughter, shouts, conversations, steps, and movement around the artworks. However, I focused my attention on shrill hullabaloo caused by the replica Critters. In the late 1950s, Lygia Clark, who worried about issues related to medium, broke away with painting and proposed creases in the plane that would be cast in space. The concept of living organism was used on Casulo (Cocoon) (1959) and in the series Critters (1960), which was awarded the best national sculpture at the VIth São Paulo Biennial in 1961. The Critters are objects made from “polished metal” of different sizes, which planes/faces are articulated by hinges. These structures unfold in their space and acquire different shapes when manipulated. Currently, the original parts cannot be manipulatedLook to this action video from the Brazilian artist Luiz Roque about the prohibition to manipulate an original Critter that was displayed at Museu de Arte do Rio Grande do Sul, Brazil. Accessed on 05/30/2015. when exposed. However, replicas were created so that the audience can handle the pieces and understand what was proposed by Lygia Clark. While handling the replicas, I understood what Lygia Clark meant about Critters having “a life of their own” and the movements they could make (Clark apud Brett, 2005, p. 98). Critters are a living, receptive work that needs activation. In contact, it establishes an intimacy with the subject (participant) and vice versa. In action, its faces react: they fold, unfold, beat, slide over one another, open up – the inside becomes outside and the outside becomes the inside –, they hasten, stumble on their own until they find the “best” position and go into a state of rest/standby. […] In many of them, due to their complexity and structural superposition, a kind of internal gear results in a plane in space, or its simple displacement, immediately impacting on the whole, and all the parts start moving on their own in search for a new position. The work moves sometimes as an insect, or the idea of a strange machine for building space is then suggested […] (Pedrosa apud Brett, 2005, p. 119). A lot is written on the works of Lygia Clark, mainly about the series Critters. Every article I have found until now, makes reference to the sensorial dimension of the series, focusing on its spatial, visual, tactile, interactive and participatory characteristics. However, the aural dimension of Critters is neither mentioned in its original objects nor in the replicas. In one of these articles, Sueli Rolnik (1996) reflects on Lygia Clark’s poetical thinking and applies it to contemporary subjective issues. In order to do that, she uses resonant words such as: murmur and gaggle. […] our body-critter has been kicking more than ever: with the new technologies of communication and information, each individual is permanently inhabited by flows of the entire planet, which multiplies hybridizations, accordingly sharping the engendering of differences that vibrate in the body and make it gaggle. […] many flows, much hybridization, production of heightened difference but, paradoxically, very little listening to this murmur, little fluidity, potency of enfeebled experimentation. In this world of marketing subjectivities, minimal tends to be the permeability between art – where, and only where, the gaggling is heard as an appeal to creation – and the rest of the planet. Outside art and the artist, each gaggling of the critter, each death of a figure of the human tends to be lived as the annihilation of everything […] (Rolnik, 1996). I have a Critter, yes, and it was the object of the first video I ever made in life… In this video, I just threw a soundtrack over it… but you can at least see how ‘he’ is and something of its moving… this sculpture is on a glass table (80’s) and, since it is made of metal, the pointed ends scratch the glass and produce great high sounds… but the hinges make very little noise, even if they are old… It is very delicate, but ‘playing’ it alive would be fantastic… (Dos Santos, October 2012).Website with the original forms created by the original Critter - Dos Santos family collection (RJ). Soundtrack by Joaquim Pedro dos Santos.​ Another work that uses Critters as a reference and mixes with new Technologies is called Bichos Impossiveis (Critters Impossibles) by Alexandre Range. All Accessed on 05/30/2015. In this statement, Joaquim lets us know about some sound qualities of the original Critter when he highlights the din “comes from outside” and it is created by the friction between the object and the material that holds it. Also, when he distinguishes it from a lower sound, produced inside the gears (hinges), in spite of its long life. Marion Velasco, handling the Critters replica, 2012. Photo video still Image of the artist. In the Lygia Clark exhibition, perhaps the material used, so much vibration and friction made the replica Critters noising with intensity and in different ways, especially the hinges, but also by the planes and tips when tumbled, scratched and or were supported on wooden bench. The gaggle of nine replicas – each with its own timbre and sound level – when manipulated by the audience at the same time, created a murmur that built some kind of “aural brick wall” (Deleuze and Guattari, 2007, p. 116). The materiality of the voice, in the sense used by Paul Zumthor (2007, p. 82-85), is the reason the multiple voices from the Critters mark their presence and create Ritornellos “establishing a center and designing a place” (Ferraz, 2005, p. 77). When they gaggled, roared, growled, chirped, tweeted, croaked, what we heard in the exhibition room was a (Metal) Jungle territory. The strength of these noises motivated me to visit the exhibition again, to capture the sounds with a high quality recorder. This meant planning another trip from Porto Alegre to São Paulo. I also had to go through a lot of bureaucratic procedures with the communication, public relations and events sector of Itaú CulturalThe recording was authorized on an e-mail conversation I had with Luciana Cristina Silva Soares (from Itaú Cultural visual arts sector), Larissa Correa, and Bruna Bertolucci Camargo Silva (the communication, public relations and events sector of Itaú Cultural) in October 2012. to have an authorization to use the exhibition’s image and sound. During this second trip to São Paulo, I stayed at home of artists, where I found another work that was potentially sonorous: the pieces Ping Poem. These are ping-pong balls with words printed on them, created by the artist Lenora de Barros (São Paulo, 1953) who works with issues related to identity in association with words through photography, video, performing actions and sound exhibitions since the late 1970s. These poem-objects have a variety of versions, one of which dates from 2006. The words written on the surface also vary – the ones I handled had the name Ping Poem. In calling to the game (playful and poetic), this work can be inscribed as a proposition to perform. 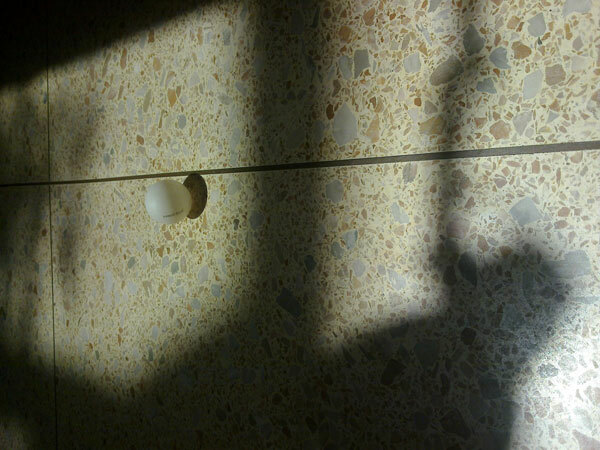 The use of ping-pong balls is also part of the work from Manuel Rocha Iturbide (Mexico City, 1963), who created the Ping-Roll sound sculpture in the late 1990s. Unfortunately, I just met it recently. This work consists on seventy ping-pong balls displayed in a thin aluminium plate supported by four legs. The balls vibrate, jump, and ring producing noises when activated by three horns (subwoofer, medium, and high) disposed in under the plate. Bruce Nauman (Fort Wayne, USA, 1941) was another important artist who threw balls against the floor in an action filmed in his studio. The action was called Boucing two balls between the floor and ceiling with changing rhythms (1967-1968). In this work, Neumann draws the space using the balls, his body and a series of sparse noises. Thus, in order to capture the sounds, my action was to play four Ping Poem balls on the flagstone floor from the house I was in. The lightness nature of the ping-pong balls, the popping, is naturally aural. That way the balls announce their routes in the space, indicate flight time and fall, jut, create turnabouts, take directions according to encounters (starting ritornellos) and, chaotic, may position themselves anywhere – “Goodbye, I go without looking back…” say Deleuze and Guattari (2007, p. 138). The tendency of the ping-pong ball is to bounce / jump in a discontinuous movement. The fact that a continuous frequency makes the balls to bounce and roll on a table is a paradox because the discontinuous sound of the balls do not produce any effect. The two states of the balls, the discontinuous and continuous peal are intrinsic to it and inseparable. This phenomenon is similar to the Quantum Theory in which the light may behave both as a wavy motion (continuous) and as shaped particles called photons (discontinuous). Acoustically speaking, the discontinuous bounce represents rhythm and the fast continuous bounce represents frequency. So we have a dialectics, the game established between two essential sound elements (Iturbide, 2013, p. 136). In the sound piece Metal Jungle, I believe that the hollow, fast and deterritorialized sound produced by the Ping Poems composed with the metallic noise of replica Clitters, has the aspect of ritornellos that, according to Deleuze and Guattari (2007, p. 117), opens, grafts or put to germinate “wandering lines” with spins, knot, speeds, movements, gestures and different sounds. Ping Poem on the floor. Image of Marion Velasco. 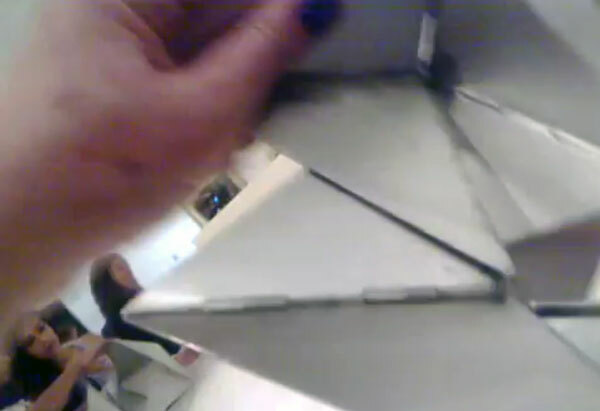 All the captured material indicates the duration of my actionVideo recorded on my mobile phone of my interaction with the replica Critters and other visitors at the exhibition “Lygia Clark – uma retrospectiva” at Itaú Cultural, São Paulo. Acessed on 05/30/2015. with each of the Critters – replicas plus the soundscape with ping-pong balls sound. In post-production, I edited this material with equipment and softwares created for musicians and DJs. One of the procedures used was to cut specific parts of the recording – samples – in order to play them and compose a piece. The captured timbres were not modified with plug-ins or other effects so that each sample is the sound of the replica Critter and the Ping Poem. The other noises captured in the exhibition room and those produced by the visitors were not edited out, remaining as background noise.For Murray Schafer, background noises are those sounds which we receive unconsciously and only notice when they stop (Murray Schaefer, 2010, XCI). John Cage warned us about the nonexistence of silence, because “there is always something happening to produce sound!” (John Cage apud Schaffer, 2011, p. 118). And Murray Schafer (2011, p. 120) complemented by, “behind every piece of music, another piece of music is hidden – the tiny world of sound events that have carelessly accepted as ‘silent’. Noise is sound that we've been trained to ignore.” So, for me, the exhibition visitors created some space-time deepness and a homely sensation. The sound piece began to shape up when the samples were put in the sound live controller, Novation Ableton Lauchpad – a sensorial equipment (aural, visual, tactile), that allow us trigger, juxtapose, compose with samples by light keys, and played live. This kind of sonic assemblage lasted sixteen minutes. 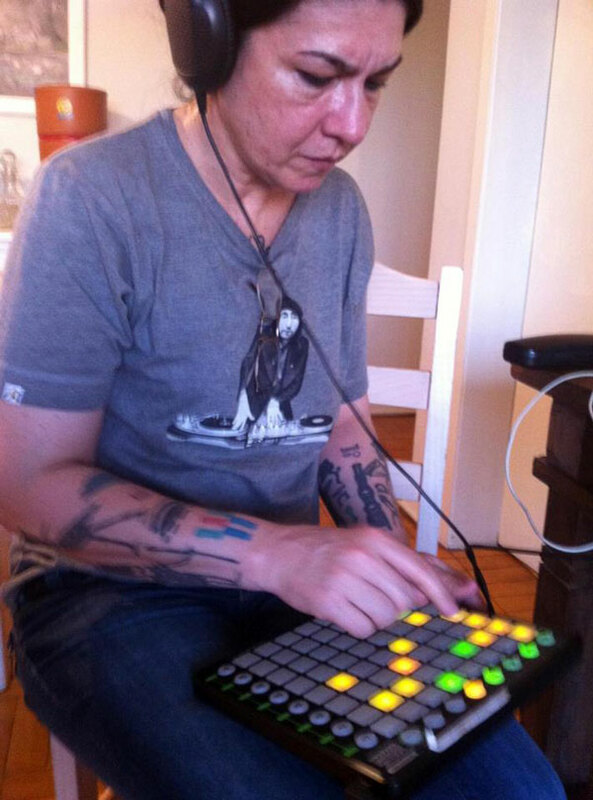 Marion Velasco at work with Novation Launchpad in the Rubino's home studio. Photo by Vicente Rubino. Porto Alegre. RS. 2012. The manipulation of the samples done on the Lauchpad is related to those experiments I did with the Critters – replicas objects – and the Ping Poem in São Paulo. Now the Critter folds, unfolds, beats, slides, precipitates, falls, goes in and out and blends in popping of the Ping Poem when the electronic keys are pressed. That way we have another aural dimension of the Critters replicas and Ping Poem with mechanical noises and digital voices that were summoned by their and by my gestures. The Critters and the Ping Poem return, show themselves, mark their territory every time a sample is repeated or each time a gaggle is identified. Even considering the fact that the voices appear in a disordered, asymmetrical way in the piece, their little Ritornellos are recognizable. I dreamt about a technological critter. In fact, I think I was catalogued by aliens. I was in a public space – a gallery, an atelier, I don’t know… suddenly a critter – like a centipede with the faceted body and that shrimp crust, only pearly white – stung my left forefinger. The “sting” was white and was quite outside the finger. In its end, a kind of dart tip was seen, only folded. A person saw the scene and said “My God, you were stung!” which made everything look worse than I had imagined… But I didn’t feel a thing. The critter walked a little and stopped. Even paralyzed, it vibrated… I took one of its ends and pressed it. 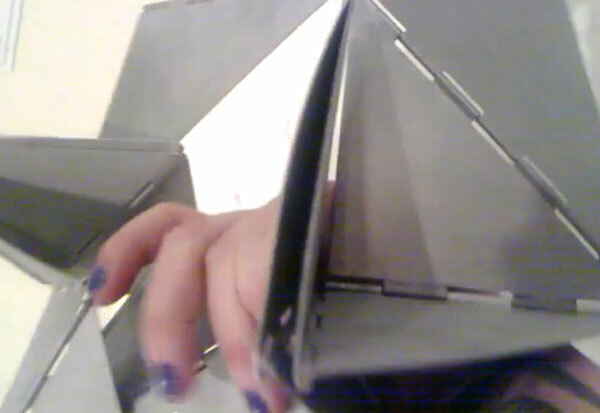 I wanted it to break. What I thought was the head did not actually come out; I took no more than a splinter. It stood there, vibrating… Now, on my finger…, I did not want to touch the sting and I left it…, but something started to change: that broken-folded base started to open up like a flower. In the beginning, everything was in light hues; afterwards, the “petals” were quickly changing their patterns… from floral to checkered, from checkered to striped, from striped to dotted, from dotted to zigzag, to zigzag, to zigzzzzzzzzzzzzzz (Velasco, December 2010). I understand my voice in the sound piece, during the live action on the web radio or in the version recorded in studio and available on my Soundcloud profile, as the market trader´s scream, thought of by Deleuze and Guattari (2007, p. 129) that ascertains its presence, “crosses in the middle […] – each marks a territory where the same activity cannot be practiced nor the same scream can echo,” but also goes in and out, creating a rupture in the design, now territorialized by the samples. The MaisonM show that broadcast the sound piece Metal Jungle and its action was aired at Mobile Radio, on November 11th, 2012. Marion Velasco in MobileRadio. Photo by Leandro Cardoso Nerefuh. SP. 2012. The Critter is not the animal critter, it’s a mechanical gadget, “weird space building machine,” but this was the way it was thought by Lygia Clark, because it acted likewise. The original Critter performs on the intimate relation with the other (the participant). It moves, creates and destroys its territory nonstop, but is seems to have little voice. It’s its replica, its double – created to maintain the integrity of the original piece – that makes it gaggle. The din produced does not seem intentional. Used as an aural capacity of the work, it happens perhaps at random due to the material and the way the replicas were built. So, fortunately, these ordinary voices gaggled, grumbled, shouted, sang, more or less as the birds do at dawn and dusk. The noises imposed themselves, unfolding into new territory in the exhibition room, just like their transformer-mode and they shape creating will. Through digital technology, it was possible to unfold the works of these two important Brazilian artists. It happened in the editing and folding operations, which transformed the noises into samples, and in a conceptual operation proposition: touching works of art. Furthermore, there is always the possibility of summoning the Critters and Ping Poem voices, adding them in other ways and new versions. During the research and presentation of Metal Jungle at radio art web, three tripsThe third trip I made was to present the three MaisonM shows at Mobile Radio - 30th Bienal de São Paulo, and was financed by the Post-Graduate Program in Visual Arts – IA – UFRGS / Rio Grande do Sul, Brazil. between Porto Alegre and São Paulo were made. I went to five distinct places to create and present this work. I acted and recorded the noises in São Paulo at Itaú Cultural (replica Critters) and the home of artists Lucia Koch and Rodrigo Bivar (Ping Poem). The post-production of the material was done at Centro de Música Eletrônica (Electronic Music Center) - PPGMus/UFRGS (pre-editing) and musical producer’s Vicente Rubino (editing/samples, composition/action, live, mixing) home-studio, with help from the visual artist Chico Machado, both in Porto Alegre. The live presentation aired on the Radio arte web MobileRadio, at the 30th Bienal de São Paulo, in the Ciccillo Matarazzo pavilion at Parque Ibirapuera, in São Paulo. The equipment and softwares used for this work were: mobile phone Nokia Navigator (for sound clips, video photography), recorder Zoom H4, sound editing software Nuendo 4 - Steinberg, sound controller Novation Lauchpad – Ableton Live. The sound piece Metal Jungle and this article are part of my doctorate research in Visual Poetics, titled “ERRAGEM-Performatividade, Voz e Outros Sons (ERRAGEMMade up Word I found in a visual communication noise. The sign of a building supplies shop in my hometown was supposed to read FERRAGEM but the F had been ellipsed. That way, the word read ERRAGEM, which, in Portuguese, refers to the work error and the act of making a mistake.-Performativity, Voice and Other Sounds)”, which provides an investigation of Sonic Performances with voice, sounds, artist’s band, soundscape and radio art programs. BRETT, Guy. 2005. Brasil Experimental: Arte / Vida (proposições e paradoxos). Rio de Janeiro: Contra Capa. 2012a. Lygia Clark: uma retrospectiva (caderno de exposição). São Paulo: Itaú Cultural & Associação Cultural O Mundo de Lygia Clark. 2012b. “Lygia Clark: uma retrospectiva.” Site Internet Itaú Cultural. http://novo.itaucultural.org.br/programe-se/agenda/evento/?id=60416. Accessed on 20 June 2013. 2012c. “Obra Lygia Clark é revista em grande retrospectiva paulistana.” Folha de S. Paulo. August 30th 2012. http://www1.folha.uol.com.br/ilustrada/1145183-obra-de-lygia-clark-e-revista-em-grande-retrospectiva-paulistana.shtml. Accessed on 30 June 2013.
w.d. “O mundo de lygia clark.” http://www.lygiaclark.org.br/noticiaPt.asp. Accessed on 30 June 2013. DELEUZE, Gilles, GUATTARI, Félix. 2007. Mil Platôs, vol. 4. São Paulo: 34 (3rd reprint). FERRAZ, Silvio. 2005. Livro das Sonoridades [notas dispersas sobre composição] – um livro de música para não-músicos ou de não-música para músicos. Rio de Janeiro: 7Letras. 2013. El Eco está en todas partes. Colección Antítesis. Ciudad de México.MELIM, Regina. 2008. Performance nas Artes Visuais. Rio de Janeiro: Jorge Zahar Editora. 2009. “Reconstruções e Interpretações de Performances nas Artes Visuais”. In LABRA, Daniela (curator). Performance Presente Futuro, vol. II. Rio de Janeiro: Aeroplano. 2011a. O Ouvido Pensante. São Paulo: Unesp. 2nd edition. 2011b. A Afinação do Mundo: uma exploração pioneira pela história passada e pelo atual estado do mais negligenciado aspecto do nosso ambiente: a paisagem sonora. São Paulo: Unesp. 2nd edition. 1996. “Lygia Clark e o híbrido arte/clínica.” Percurso magazine. São Paulo. http://www.caosmose.net/suelyrolnik/pdf/Artecli.pdf. Acessed on 05/30/2015. 1999. Molda-se uma alma contemporânea: o vazio-pleno de Lygia Clark. http://www4.pucsp.br/nucleodesubjetividade/Textos/SUELY/Molda.pdf. Acessed on 05/30/2015. ZUMTHOR, Paul. 2007. Performance, recepção, leitura. São Paulo: Cosac Naify. 2nd edition. is a multidisciplinary artist and researcher with experience in Visual Arts (performance, photography), Design, Sound Art, Music, Urban Culture and Education. She has is a doctorate candidate in Visual Poetics from the Post-Graduation Program in Visual Arts at Federal University of Rio Grande do Sul (UFRGS), Porto Alegre, RS, Brazil – advised by Professor José Avancini (IA-UFRGS) and co-advised by Professor Mario Ramiro (ECA-USP). In 2015, she was an exchange researcher from CAPES/Brazil (BEX9954/14-7) in the Department of Sculpture at the Faculdad de Bellas Artes de San Carlos, Valencia, Spain – advised by Professor Miguel Molina Alarcón. She has a Master’s degree in Design from the Anhembi Morumbi University (SP, Brazil) and Bachelor’s degree in Visual Arts at UFRGS (RS, Brazil). She is part of the following research groups in Art and Design: Inter-relations in Contemporaneity (zigzag-transversality and fashion design) of the Post-Graduation Program of the Anhembi Morumbi University and Art and Historiography at the Post-Graduation Program in Visual Arts at UFRGS. She has written articles for exhibitions and papers on art, music, fashion, and urban culture, which were presented in Universities in Brazil and abroad, and published in books, magazines and websites. As an artist, her work has been displayed in Porto Alegre (RS, Brazil), São Paulo, Rio de Janeiro and on the internet. Between 1990 and 1996, she was responsible for the voice, lyrics, and executive production of pop rock bands and of an electronic music duo. From 1996 to 2005, she participated as a featured singer in songs from various bands from the south of Brazil. She has songs recorded on vinyl, cd compilations and K7 tapes. Presently, she works as an independent teacher in the Porto Alegre-São Paulo axis. is a multidisciplinary artist and researcher with experience in Visual Arts (performance, photography), Design, Sound Art, Music, Urban Culture and Education.